For the second time in my life, I’m making the move to no poo – no shampoo hair care, that is. The first time I tried it, it was partially out of necessity, as we didn’t have running water or an easy place to wash my hair (which was long enough to require a large amount of water to shampoo). This time, it’s more from a desire to have a simpler (and cheaper) routine for my personal hygiene. I use Dr Bronners soap, which is safe, cheap, and effective, but I really don’t like washing my hair with it, so if I can get by without using shampoo, I’m a happy guy. And after over a month in, the no poo method is working well for me. This first couple of weeks of the no poo experiment, I just brushed my hair well before showering, rinsed it thoroughly, and dried and brushed it as usual. I could start to feel the oils building up on my hair and scalp, but it wasn’t obvious or noticeable to anyone else. If anything, the oils in my hair kept the little wispy flyaway hairs out of my face, and added body to my hair. At the beginning of the third week, I felt like I really wanted to scrub my scalp, so I took a couple of tablespoons of baking soda, mixed it with a little water, and used that to “wash” my hair, rinsing it with plain water afterward. My scalp felt super-clean, but my hair felt a little dry afterward, as we didn’t have any vinegar on hand to follow the baking soda treatment. This last weekend, we just got back from a two week road trip, so after almost 2000 miles in the truck, including camping just about every night, a couple of hot springs visits, and a sweatlodge, so I was ready to really clean my hair again. This time, I made sure we had apple cider vinegar, and did the above baking soda wash, rinsed that out, and then mixed a little vinegar with water and poured that over my hair. After a minute, I rinsed it out, and I could instantly feel the difference it made to the ‘tangle factor’ of my hair. There was a slight vinegar scent even after rinsing, but it quickly went away as my hair dried, probably helped by the fact that I usually sit in the sun until it’s dry. Previously, I was making a strong batch of rosemary tea, sometimes with nettles or horsetail, and using that instead of baking soda and vinegar, so I believe I’ll alternate the two and see how that works out. I’ve also heard that fresh lemon juice is excellent, so if I see a good price on lemons, I’ll give that a go as well. As it stands now, after 6 weeks of no poo, my hair feels and looks healthy and clean, so I see no reason to go back to buying shampoo ever again. So why would you choose to switch to the no shampoo method? 1. It’s one less thing that you need to spend money on. 2. Even ‘natural’ shampoos have ingredients that aren’t so great for us, and many of them contain toxic chemicals as well. 4. Think of all the water going down the drain full of shampoo and conditioner, adding to the burden of needing to be treated to remove those residues (or to be leached into your yard through the septic system). Instead, baking soda, vinegar, rosemary tea, and lemons are food – pretty basic stuff. Cranberry juice sounds cool! I wonder if I could use something near me like prickly pear fruit to use as a juice? When I was using shampoo, sometimes I would put coconut oil my hair for a bit before washing it, and then after rinsing the shampoo out, it would feel conditioned. I haven’t tried olive oil yet. I am sure the prickly pear would work just as well. I don’t use coconut only because I am allergic. I have also heard good things about aloe, and almond oil. I suppose all are just personal preferences. Steaming some prickly pear in hot water with some herbs and vinegar would prob make a very nice rinse and an easy thing to customize! I could probably easily go no poo as my hair is really short at this point (what’s left of it!). As it is I shampoo once a week with my wife’s shampoo (ironically called No-Poo). I bet I don’t need it and perhaps I do it more habitually than anything. I have also used Dr. Bronners as shampoo, and that would probably also work well for my short hair…But nothing may be best. I agree on the cyclical nature of shampoo/conditioner and lip balm. If your lips are dry just drink more water! Finally, baking soda is fantastic. I wanted to switch from aluminum ridden deodorant /antiperspirant to something more natural, but found that nothing (the crystal, Tom’s of Maine, etc) worked. Then I read about baking soda and it works great. Baking soda, shea butter and some lavender oil for scent. I find that layering a dusting of baking soda after the crystal is a fool-proof method for me. Using just one or the other doesn’t work. I would not put lavender oil on my skin because it is a known irritant, even though it smells wonderful. I was no poo for almost 2 years and i loved it but our water is really hard and I started having major issues with buildup and dandruff. One thing I did like to do was a occasional thyme tea clarifying rinse. It smelled wonderful and I felt it really helped my scalp. Sadly it just wasn’t enough. I am using a pretty simple natural shampoo which I am happy with, my hair likes it and most importantly my scalp does as well. I’ve been on this juicing/detox path and learned recently that dandruff is a sign of being yeasted. it’s actually flakes of yeast. so that may be why you thought this method wasn’t working for you. Natalia Rose’s Detox 4 Women is a really good anti-candida approach as is The Body Ecology Diet. Hope that helps! Ugh, spammers. Dandruff is simply dead skin cells. Actually there are 2 types of dandruff. One is dry scalp, comprised of tiny dry flakes, and the other is a yeast-related (malassezia is the specific yeast) condtion, comprised of larger, waxier flakes. This is the type of dandruff commonly treated with tar-shampoos or zinc-pyrithione shampoos like Head-n-shoulders, which kills the yeast. I know this from my experience and education as a hairdresser. Awesome post. I went no poo for 2 years as well. I found, like mudnessa my hair gradually had build up due to hard water. I thought I might try it again using rain water if I can manage to store it. A couple more things you may or may not wish to experiment with – 1 is pineapple juice! This was amazing and, yeah, ok you can drink it and it might not be the best thing, but as a 4-6 weekly treat it seemed to really clean my hair. The second one was soapwort. We grow it in the garden (it grows like mint so you need to contain it), harvest the flowers, stems and leaves, boil it up for 10 minutes, then leave to infuse and strain. After that you can put it in one of those cappuccino frothers and you get a few suds from the natural saponins. This wasn’t quite as good for my hair (fine and flyaway) but for DHs which is really thick and wiry, the soapwort was excellent and made his hair very soft. Apparently soapwort is used in museum to clean fragile tapestries…. I now use clay. Again, it does tend to build up after a while but it really improves the quality of my hair and adds body to it because I’m not stripping it with harsh chemicals. I found during my two years of bicarb and cider vinegar the colour of my hair changed dramatically; it nearly went orange (my natural colour is very dark with auburn / red highlights, so I guess it started to bring out the red A LOT!) Your hair looks a similar colour to mine; so just a friendly warning! I haven’t tried going fully shampoo-free (sorry, ‘no poo’ just makes me think of kindergarten); I tried it for a week, and it was itchy, so I went back to shampoo. I’m a fan of shampoo bars, which require a lot less packaging. I do swap baking soda for shampoo once every two weeks or so, and think I could easily use diluted apple cider vinegar instead of conventional conditioner for the rest of my life. Baking soda also makes a decent emergency dry shampoo, by the way. Just sprinkle it on, rub it into the scalp, and brush it out. It absorbs oil quite nicely. Look, ma, no water! I’m on week 4 of the no poo experiment. In the last month, I’ve only washed my hair a few times because I’m trying to let my scalp recoop from the last 35 years of shampoo. I was telling someone how the baking soda with ACV rinse was leaving my hair dry – she recommended jojoba oil because it’s very similar to our natural skin and hair oil. I bought a small bottle to try once I wash my hair again (probably tonight, it’s starting to get greasy). I switched to a baking soda ‘wash’ and apple cider vinegar ‘rinse’ about 6 months ago and I’ve never looked back! I made the switch after reading about a friend’s ‘no poo’ adventure and I thought it was a great way to reduce my exposure to toxins as I prepare my body for pregnancy. It’s a cost effective alternative as well! One thing you can try if you dont want to use those expensive shampoos , the natural Defne Plant (Laurus nobilis) Oil Soap ; in the Mediterranean coast of Turkey it is so populer. It is hand made. I have been poo free for 5 months now. I use baking soda and lemon juice. The stray grey hairs I had are gone, as is the itching rash on my back. Gone also are the disgusting fruity and flowery smells, and the mosquitoes such scents attract. I wish I had never used shampoo and conditioners now, and wonder how I can get a refund from Proctor and Gamble. When I first got to Taos, I had a drunk Indian tell a very pregnant me how he digs up yucca and uses the root to wash his hair. Lather, rinse, repeat – same as shampoo. lol It is sometimes called Soap Yucca, or something similar. It is the narrow-leaved yucca, not the wide leaved. You may have it growing down by you. Thanks for the tip, Nan! Great tips(your advice and your hair ha ha ho ho, ok you can stop laughing now), I was going to mention coconut oil as well, but you beat me to it. It is supposed to help as a pre-treatment cleanser. I haven’t gone no poo quite yet, use a Trader Joes shampoo that is pretty good, but I have been noticing it hasn’t been working quite as well lately. I hear ya on the lip balm – I never use it either and my lips are great thank you very much. 🙂 I have tried the apple cider vinegar trick but didn’t know about using baking soda – I’ll have to give that a try. I know I’m a bit late cming in but after stumbling across this article on the hunt for an excellent detangler I though someone here might know? 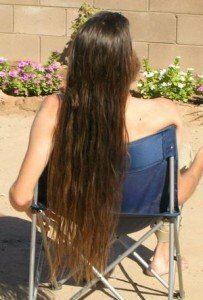 I have waist long hair and a two year old as well as two other kids and it just doesn’t mix well. I am constantly getting an impossible dreadlock in the middle of my hair from just tossing it up in the morning and leaving it loose when I finally fall into bed at night. I know just brushing my hair would prevent this but it seems every time I get the huge snarl com led out it only takes a few frees before that one day where I’m too exhausted to comb my hair out in the shower and I just throw it up into a ponytail when I get out and the vicious cycle begins. Any advice on what I could use either in the shower or out that will really detangle my hair? Oh my goodness my Auto-word is bad, thought I caught them all. Apologies..
Hope that helps make a little more sense. Great info, thanks for sharing. I’ve used vinegar before but never with the baking soda. Also coconut milk is a wonderful treatment for dry hair. I would love to try out the “no poo” method of cleaning my hair. However, I don’t think that everyone is just as adventurously ready to try it out, especially if you have to go to work every single day. It could be embarrassing to smell around people who are neatly groomed and cleaned. But then, if you are on for saving money from buying shampoo, then why not? I am just saying that this method won’t just work with everyone. If you are at home, and you don’t have anything to do, I highly recommend that you try it out! It says wonders, so why not? I must say, I find it amusing that you think a person who doesn’t use shampoo would smell and so only a person who stays home would be able to use the no poo method. I am an office supervisor at a school and am always around people; coworkers, teachers, parents, students. I have been “poo free” for almost two months now and am happy to report that I do not smell. In fact, I have gotten many compliments on the health of my hair and my complexion. Oh yeah, get this, I also don’t wash my face with soap. (Gasp!) I went on the “oil cleansing method” at the same time that I ditched shampoo. I am so happy with my choice and the results that I am not looking back. By the way, I never knew what clean hair truly smelled like until I went “no-poo.” As Derek points out, shampooed hair smells like the fragrances added to the shampoo. Ever wonder what smells those fragrances are trying to mask? This method does not make you smell any different than your colleagues and unless you broadcast what you’re up to no one will notice a difference! I just ran out of shampoo and would really like to try going without. But I swim alot and I was just wondering what to do with all the clorine in my hair and the smell of it. Any advice? I am very interested in going no-poo, but I have a problem. I sweat… a lot… and it makes my hair stink! What would you recommend? I love patchouli and am wondering if I could do something with that? I have fine hair that is down to my shoulder blades.